Please click on the section you want to find out more. SLIDE provides an integrated personal solution to financial, commerce, and social networking activities in a mobile application on smartphones. WALLET: Make fast payments for SLIDE services using your own e-Wallet. SEND OVERSEAS: Send money to family and friends in the Philippines, Indonesia, Myanmar and other countries. SEND LOCAL: Send money to family and friends locally. PAY BILLS: Pay your local and overseas bills, top up your prepaid mobiles, pay your insurance premiums. CHAT: Message your family and friends, and get instant notifications of your transactions and account updates. GROUP BUY: Get discount offers when you buy items from SLIDE Group Buy and when you recommend your friends to do the same. Why should I use SLIDE? SLIDE provides you with an easy and convenient way to manage your personal finances and monetary transactions. All you need is a smartphone and Internet access! How do I log in to SLIDE? You need to first register a user account with SLIDE. Once you have a SLIDE account, you can log into the app using your mobile number/email and your password, provided your mobile phone is connected to the Internet via mobile data or Wi-Fi. What type of mobile phones can I use SLIDE with? SLIDE works on iPhones with iOS 8 and above, and Android smartphones with Android 3.0 and above. Can I use SLIDE in Singapore and overseas? Yes, you can use SLIDE anywhere in the world, provided you have an Android smartphone or iPhone and Internet access, though you may incur additional roaming and data charges if you are not using a local mobile service provider. Who is the developer of SLIDE? SLIDE is a proprietary mobile technology platform developed by iAPPS Pte Ltd, a pioneering financial technology company based in Singapore. iAPPS is also technology partner of Sport Singapore’s ActiveSG movement which developed the ActiveSG app. Where is SlideSG Remittance and Money Changer Centre? The SlideSG Remittance and Money Changer Centre is located at Lucky Plaza #02-50. It is where SLIDE Member Service Officers assist individuals to sign up as SLIDE Members. These Officers also provide technical support to SLIDE Members who require help in using SLIDE. Who is eligible for SLIDE? You need to have either an email address or a mobile number to be able to register an account with SLIDE. How do I sign up with SLIDE? Download ‘SLIDE MEMBER’ app from Google Play or Apple App Store. Tap ‘Get Started’ at bottom right corner. Enter your display name, password, mobile number and date of birth (same date as your identification card). Enter OTP (One-Time Password) to your mobile phone via SMS. Why do I need to enter my date of birth when registering? This is for our partner agents to search for you on the SLIDE system when you want to conduct monetary transactions. Why should I verify my email address? You have to verify your email address in order to receive the receipts of your transactions, account updates, notifications and promotions via email. You also have to verify your email address if you want to use it to log in. To verify your email address, please open SLIDE app and click/enter the following: Me > Edit > Enter password > Tap on email address > Enter email address to verify > Enter OTP that was sent to your email > Submit. Why can’t I log in with my email? You can only log in with a verified email address. To verify your email address, please refer to the previous question. Can I sign up for SLIDE more than once? No, you cannot sign up for more than one account using the same mobile number and email address. When I try to sign up, I get a message “User already exists”, why? This means that your mobile number has already been registered with SLIDE. Try logging in as an existing user with your mobile number or email address. If you forgot your password, reset your password by selecting ‘Forget Password’. If you experience this problem despite not having signed up with SLIDE before, please contact our help desk at +65 6594 1380. Open SLIDE app > Tap ‘Me’ > Tap ‘Edit’ > Tap ‘Password’ > Enter your old password > Enter your new password > Confirm the new password by re-entering it > Password successfully changed. Can I edit my profile after I sign up? You can only change your profile picture, display name, password, mobile number and email. If you want to change other details such as your address, date of birth, salary and occupation, please visit our SLIDE Member Care Centre at Lucky Plaza #02-50. To verify your email address, please open SLIDE app and click/enter the following: Me > Edit > Enter password > Tap on email address > Enter email address to verify > Enter OTP that was sent to your email > Submit. I would like to close my SLIDE Member account. How do I get back my money in my SLIDE WALLET? Remit the full balance in your SLIDE Wallet to your recipient(s), then send an email to [email protected] with your full name, mobile number and SLIDE ID to close your SLIDE account. If you want to get your money back in Singapore Dollars (SGD), please send an email to [email protected] with your full name, mobile number and SLIDE ID, and state your intention to withdraw all your money in SGD. We will process your request within 30 working days. Is using SLIDE MEMBER app safe? All the information that you provided are encrypted, secured, and protected. For users in Singapore, all data in SLIDE comply with the Personal Data Protection Act (PDPA). .
Is my SLIDE WALLET secure? Your SLIDE Wallet is password-locked and every transaction requires your password or your fingerprint. All transactions are securely encrypted. You will also receive a notification in Chat when a transaction is completed. What happens if I lose my mobile phone? Call our helpdesk at +65 6594 1380 to deactivate your SLIDE account. Once you have installed SLIDE Member app on your new mobile phone, please call our helpdesk to re-activate your account. You should change your password. To change your password, follow the steps below: Open SLIDE app > Tap ‘Me’ > Tap ‘Edit’ > Tap ‘Password’ > Enter your old password > Enter your new password > Confirm the new password by re-entering it > Password successfully changed. If I lose my mobile phone, can anybody take my money out of my SLIDE account? No. Your SLIDE Wallet is password-locked and every transaction requires either your password or your fingerprint to be approved. How do I top up my SLIDE WALLET? You can top up your SLIDE Wallet by either using cash or doing bank transfers. How much money can my SLIDE WALLET hold? The maximum amount of money for SLIDE WALLET varies for different currencies. For Singapore, the SLIDE WALLET can hold up to S$999.00 at any time. I entered the wrong Transaction Reference Number when conducting a bank transfer. How can I change to the correct reference number? You can cancel your bank transfer request. Open SLIDE > Go to “Top Up” > Click “Status” > Cancel the ‘pending’ transaction > Submit a new bank transfer request with the correct reference number. Is my money in SLIDE WALLET safe? Your SLIDE Wallet is protected by your password. Keep your password confidential. Can I remit at SlideSG Remittance and Money Changer Centre? Yes, you can remit cash at SlideSG Remittance and Money Changer Centre. You can also use SLIDE MEMBER app to remit, provided by SlideSG Pte. Ltd, a Monetary Authority of Singapore licensed remittance company. Who can send money overseas? You must be 18 years or older, are a Singaporean, Permanent Resident or Foreigner with a valid work visa (Employment Pass/ S Pass/ Work Permit) and have a Singapore mobile phone number. For identification, for Singaporeans/ Permanent Residents is your NRIC number and for Foreigners with work visa is FIN. Can I use my passport to register if I’m not Singaporean? No, you can only use your FIN from your Employment Pass/ S Pass/ Work Permit. How do I send money overseas? Fill up ‘Registration’ page according to information on your identification card. Take clear photos of your identification card front and back, and a selfie of yourself from head to shoulder. Confirm your information is correct and tap ‘Done’ to submit. To complete your registration, visit our partnered remittance licence holder or SLIDE Member Care Centre to verify your registration. Please bring your identification card along for identification purpose. Fill up ‘Recipient Details’ for your new recipient and select your recipient’s ‘Collection Mode’. Tap ‘Save’ to record your new recipient’s details. If you are sending to a repeat recipient, select a recent recipient on screen. Enter remittance amount in local currency or recipient’s country currency. (Optional) Tap and hold your recipient’s information to view and edit the information you saved. Agree to the declaration that the money you will send is not of illegal means and not for illegal or terrorism activities. SLIDE to confirm remittance transaction. Directed to ‘Status’ page showing transaction is ‘Pending Payment’. Once processed, a notification will appear in your mobile phone to link to ‘Receipt’ page. How do I check the progress of my remittance? Also, you will receive notifications for any updates on the status of your remittance transactions in CHAT. Will I get a receipt for my successful remittance? Yes, you will get a notification in-app of your successful remittance. At Home page, tap ‘Send Overseas’ > Tap ‘Status’ > Tap ‘Send’ to see all your remitted money transactions > Tap any ‘Processed’ transaction > At ‘Receipt’ page, that transaction’s receipt is shown in detail. Why do I need to be registered and verified? For remittance, we and the authorities need to know who you really are, so you need to present yourself at our SlideSG Remittance and Money Changer shop located at #02-50 Lucky Plaza to complete your registration by verification. What do I need to bring for verification? You need to bring your NRIC or EP/ SP/ WP in Singapore to be verified. How much money can I send overseas? You can send up to your SLIDE WALLET limit per remittance transaction. For Singapore, the limit is S$999.00 per remittance transaction. What if I want to send more than my SLIDE WALLET limit? You can proceed to our partnered remittance licence holder as listed here. Where can my recipient collect the money I’ve sent? Recipients can either collect by cash pick up (MoneyGram) or bank account, depending on the collection points available in each sending country. You can see the list of banks supported and MoneyGram cash pick up option when you add recipient in SLIDE MEMBER app. How can I see the latest exchange rate? Go to ‘Send Overseas’ > the current day’s exchange rate will be shown once you put the amount you want to send and the collection mode. The exchange rate will also be shown in the payment page. How much is the remittance fee? You can view our remittance fees after you select a recipient in ‘Send Overseas’. Where can I send my money to? You can view the list of countries supported when you tap on ‘Send Overseas’ in home page. How soon will my loved ones get my remittance in my country? It depends from country to country. Account credit: Any bank account next day. Instantly to any bank’s ATM. I changed my mobile phone number, can I still remit? You must update your mobile number, if not you will not be able to submit any remittance transaction as all remittance transactions in SLIDE require OTP. To update – Home page, tap ‘Me’ > Tap ‘Edit’ > Enter your password > Tap ‘Mobile No.’ > Enter new mobile number > Tap ‘Update’. If my work visa expires, can I still remit? No. You have to update your particulars, take photo of your new work permit and proceed to our SlideSgG Remittance and Money Changer shop for verification. Can I remit for my company? That will be under corporate remittance. For corporate remittance, you may contact us at +65 6594 1380 or email us at [email protected] for further details. Can I remit on behalf of my friend? No, we strictly advise our members to remit only for themselves as much as possible. How many recipients can I remit to? You can remit up to a maximum of 10 recipients. Can I send money to friends who are not SLIDE Members? No. Currently, SLIDE only allows you to send money to other SLIDE members because the money will be going into their SLIDE Wallets and not to any other bank account. My friend has sent me money locally. How do I know I have received the money? When your friend sends you money via SLIDE, the money will go into your SLIDE Wallet instantly and you will receive a notification in Chat. I want to terminate my SLIDE account. What should I do? We are sorry to see you go. To terminate your account, please contact us at +65 6594 1380 or [email protected] and our helpdesk personnel will assist you in closing your SLIDE account. The remaining balance in your SLIDE app will then be sent to you in the form of a cheque within 3 months. Can I top up my SLIDE wallet at any 7-Eleven store? Yes, SLIDE Members can now top up their SLIDE Wallet at 50 selected 7-Eleven stores listed in the app. To see the list of 50 selected 7-Eleven stores where you can top up, open your SLIDE Members app > Tap "top up" > Choose 7-Eleven > Click "Find a 7-Eleven Store" button > Tap the search bar. Which 7-Eleven store I can top up at? You can top up at selected 50 stores of 7-Eleven. Click here to see the full list of 50 selected 7-eleven stores where you can top up your SLIDE Wallet. How to top up at 7-Eleven stores? Yes, SLIDE user can ONLY top up minimum amount of SGD 10 and maximum amount of SGD 500 per transaction or per receipt. Is there a fee to top up at 7-Eleven? Yes. You will be charged the amount of SGD 0.50 per top up. For example, you would like to top up SGD 100, 7-Eleven counter staff would ask for extra SGD 0.50 as a fee for top up. What are the payment modes to top up at 7-Eleven? 7-Eleven accepts payment only in cash. For any queries, can I call SLIDE? What if I didn’t receive the topped up amount from in my SLIDE Wallet? If you didn’t receive your top up in your SLIDE Wallet, please report it to us by calling our helpdesk hotline 6594 1380. Can I top up my SLIDE Wallet at any SingPost Post Offices? Yes. 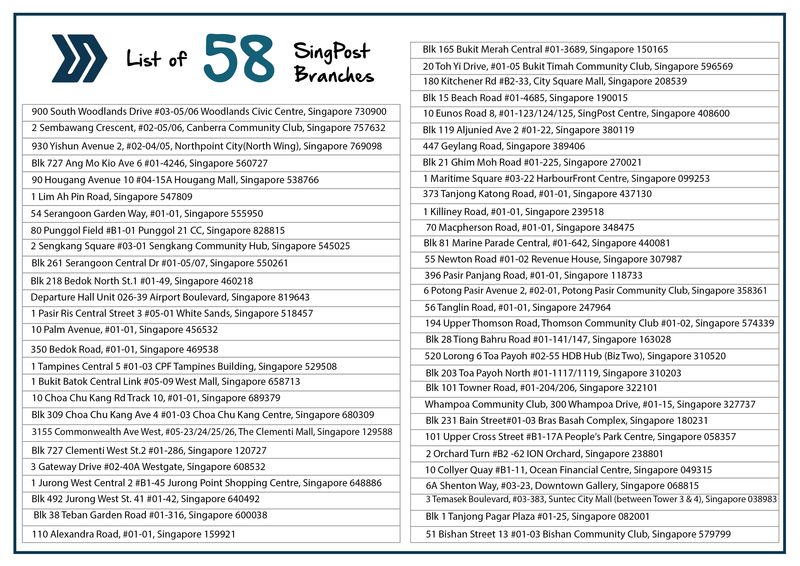 There are 58 SingPost Post Offices where you can top up your SLIDE Wallet. Please go to this link for the locations. How to top up at SingPost Post Office? Yes, SLIDE user can top up a minimum amount of SGD 10 and a maximum amount of SGD 1000 per transaction or per receipt. What are the payment modes available to top up at SingPost? SingPost accepts payments only in cash. How long do I have to wait to receive my top up in my SLIDE Wallet? Top up at SingPost is instant. If your top up hasn’t reflected, try to refresh by sliding the arrow left and right. If by doing this, you still haven’t received your money, please report it to us by calling our helpdesk hotline 6594 1380. Is there a fee to top up at SingPost? No. Topping up your SLIDE Wallet at SingPost is free of charge.